Here is a nice little video I found on using an old espresso machine from goodwill, purchased for about $5. With a little modification it can used to clean all your jewelry, just like the pro’s do. Check out your local goodwill ebay or craigslist. Plus, it still makes espressos! The bathroom is one of the most traffic areas in the home. The dirt and grime builds up in the grout making the floor look extremely dirty regardless of how often it is cleaned. A mop and harsh chemicals will only spread the dirt around from one spot to another and the cleaners smell strong as well as are harmful to the family members and the environment. 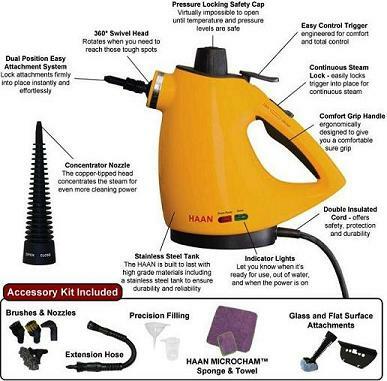 A hand held steam cleaner will completely remove, not simply move, the grime, germs, bacteria and mold. Fill the water container with water according to directions. Attach bristle brush attachment, plug in unit and let water heat up. Starting with the grout between tiles (if floor is wood or linoleum skip this step), move the brush along the grout at the rate of one inch per second. Dry with soft cloth as you are steaming the grout area. Remove the bristle brush attachment and replace with the soft cloth mop attachment. Slowly apply steam/vapor to small sections of the floor and wipe with cloth as you go along to remove any excess water. To prevent the build up of grime, germs and mold in the bathroom follow the previous steps at least once per week. If there is a build up of mold in the corners or grout, there may be a need to repeat the steaming process two to three times before continuing to remove all mold. Every week the majority of people grab the latex gloves and smelly toxic cleaner to clean the toilet. This dreadful task can be much less difficult as well as more sanitary with a steam/vapor cleaner. Toilet cleaners have terrible smells, are very toxic to the family as well as the environment, do not work very well without scrubbing and cost a fortune. 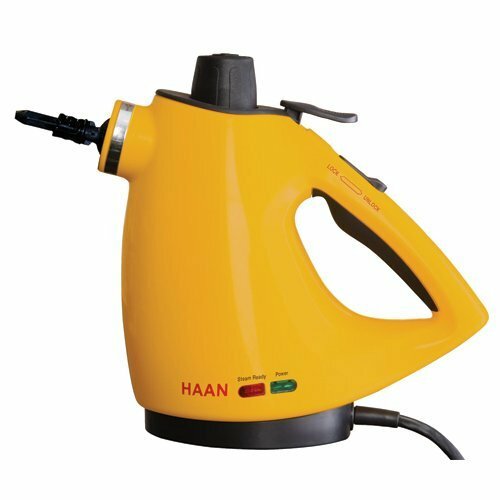 A hand held steam cleaner gets the built up stains, smells, germs and bacteria out in one cleaning session. Fill water tank on steam/vapor cleaner with distilled water according to unit directions. Plug the system in and let the water heat up. Starting with the bowl of the toilet, direct steam/vapor under the rim using the detail nozzle. If necessary repeat the steam process until the rim and bowl are clean. Using the detail nozzle aim the steam at the seat and lid, wiping dry with a soft dry cloth or sponge. Direct the steam/vapor at the section of the bowl that separates the bowl from the tank. Make sure to provide sufficient steam to the area where the bolts attach the seat. Direct steam/vapor to the tank area and wipe dry with cloth or sponge. With the detail nozzle and soft bristle brush, lightly scrub around the base of the toilet. Apply sufficient amounts of steam/vapor to remove the build up urine and other grime that builds up on floor area of the toilet base. Spray the base of the toilet and wipe entire area, including the floor around the bottom , with a dry soft cloth or sponge. Repeat these steps at least one time each week to prevent the build up of grime and to keep germs as well as bacteria at bay.